The new Brubeck Fellows have arrived! Trumpet player Max Boiko, is a 2013 graduate of Dillard Center for the Arts in Fort Lauderdale, Fla., and has studied the trumpet since seventh grade. He has won numerous awards and scholarships in national competitions, including the GRAMMY Band Jazz Session and the Jazz Band of America, and received the Outstanding Soloist Award twice at the Essentially Ellington Jazz Competition in New York City. He has studied with Wycliffe Gordon, Wynton Marsalis, Terrell Stafford and others. Max is in his first year as a Brubeck Fellow. Vibraphonist Joel M. Ross, is a 2013 graduate of the Chicago High School for the Arts and performs with the top ChiArts Jazz Combo. He has performed with artists such as Herbie Hancock, Christian McBride and Gerald Clayton, and with the Jazz Institute of Chicago Jazz Ambassadors. He was twice selected as a Thelonious Monk Institute National All-Star and has performed at the Chicago, Hyde Park and South Shore jazz festivals. Joel is in his first year as a Brubeck Fellow. Guitarist Sean Britt from Hingham, Mass., has studied jazz since age 13. He has performed in such venues as the Newport Jazz Festival and Boston’s Symphony Hall. His many accolades include Massachusetts All-State Jazz Band, National Young Arts Foundation winner, and GRAMMY Camp Jazz Session finalist. He teaches music and performs with his band, The Harbor Jazz Quartet, and has studied with Pat Martino, Stefon Harris, Steve Houghton and others. Sean is in his first year as a Brubeck Fellow. Bassist Sarah Kuo from Los Angeles, is the Institute’s first female fellow. A 2013 graduate of Los Angeles County High School for the Arts, Kuo discovered classical bass at age 12 and jazz at 14. Her performances have been regaled in the media, including CBS, Jazz Times and Jazzday.com. She has received awards from organizations such as the Monterey and Angel City Jazz Festivals and has performed with the likes of Herbie Hancock, Bob Mintzer and Natalie Cole. Sarah is in her first year as a Brubeck Fellow. Percussionist Jalon D’Mere Archie, from Houston, Texas, has been playing percussion for as long as he can remember. He was in The Skidmore Jazz Program and has been selected to the All City Band, All-Region and All-State Alternate. He has participated in jazz institutes and workshops including the American Festival for the Fine Arts Institute and has been mentored by artists such as Sebastian Whitaker, Marvin Sparks, and Matt Wilson. Jalon is in his first year as a Brubeck Fellow. 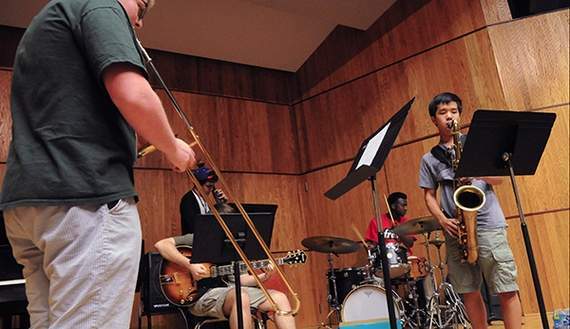 Here is a nice article by Tony Sauro from the Recordnet about our recent Summer Jazz Colony. Not surprisingly, guys who’ve been nominated for Grammy Awards are getting as big a kick out of the process as the teenagers they’re tutoring. It happens each summer when experienced professionals share their skills and experiences with young jazz musicians at University of the Pacific’s Brubeck Institute. The “summer colony” – where 18 high-school students from around the nation congregate for a week of intensive instruction – is designed to help preserve, perpetuate and propagate America’s most revered cultural export. “These are some of the finest young musicians in the world,” said Stefon Harris, a vibraphone player who’s been nominated three times for America’s top music award. “This is probably the highest level of student I’ve come across. We really are lucky to have the opportunity to be around the future greatest artists on the planet. Everyone is doing that this week, leading to a concluding concert Friday at Faye Spanos Concert Hall. “They’re brilliant,” said drummer Matt Wilson, a former Grammy nominee who’s tutoring at his fourth jazz camp this summer. “What’s great is they’re gonna come up with melodies people haven’t experienced. They’re not polluted yet. They’re really innocent and free. Dave Brubeck (1920-2012), the Institute’s namesake and visionary, definitely did that at Pacific. In the 1940s, jazz was treated like punk-rock at college conservatories. Brubeck gambled, though, often playing jazz in Stockton clubs and restaurants. Such risky creativity characterized his career. In addition to Harris and Wilson, two Grammy winners – bassists Eddie Gomez and Clark Sommers – are providing their guidance along with Pacific faculty members, other educational professionals and former summer “colonists.” The young musicians have been jamming with the pros and professors nightly at Take 5 Jazz at the Brew, too. “I have a sincere passion for education,” said Harris, 40, a native of Albany, N.Y., who also assists with Pacific’s “distance-learning” program through New York University. “I love teaching just as much as I love being on stage performing. Wilson prefers a degree of uncertainty. “I enjoy this,” said Wilson, 49, from Westchester, Ill., who prefers that learning take an “organic” approach. Harris and Wilson experienced their own instructive opportunities as young musicians. Harris, a “self-taught kid” immersed in classical music as a teenager, didn’t play jazz until he was studying at the Manhattan School of Music. As a high school member of New York’s Empire State Youth Orchestra, he met conductor Richard Bagley. Understandably, Harris and Wilson – who also reveres and values the sense of “community” – have been answering sophisticated questions this week. They have some general answers they hope to impart. “They have lots of great questions,” said Harris, who lives in East Orange, N.J. “Many of them are broader than just the mechanics. Like, ‘How do I find a way to express myself?’ I want to help them understand they already have their own voice that’s influenced by all the events in their life. The essence of music expresses a story they already possess. Ben Flocks and Battle Mountain debut at Monterey!